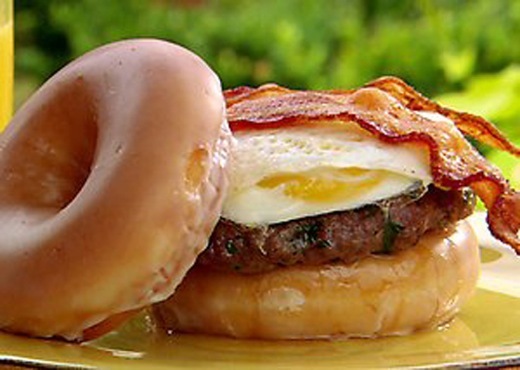 If you are like me, you struggle daily with the decision, "which should I eat, a burger or a doughnut?" Well, say goodbye to your troubles, some genius at the Indiana State Fair has combined the two. Yes, all the goodness of a cheeseburger, with a Krispy Kreme bun. It's actually called a 'Luther burger', named after the musician Luther Vandross. To make a true Luther, you only use one Krispy Kreme, sliced in half bagel-style, with the cut sides lightly toasted on a grill. When assembling the burger, cut side goes out (glazed side in) on the buns, so you can eat it without getting all sticky. It sounds strange, but the taste is unbelievable. The sweet of the bun plays off the savory of the meat in ways you can't imagine.